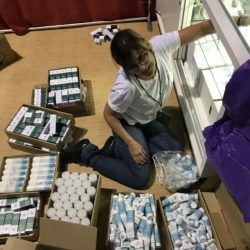 YOU make the Trade Shows possible! As you read this, my team and I are just beginning to work the Premiere Birmingham trade show. It’s two(2) full days of demo’s, teaching, talking. Non-stop from 9am till 6pm. As I’m doing my last minute errands before I leave, i’m thinking about all the things that make a trade show work. I’m thinking about all the opportunities we have, as Beauty Professionals and why, we as Distributors or Mfg’s., do what we do. It’s a pretty amazing cycle to be honest with you. And, I would venture to say…..most of you have no idea. So, let me share! 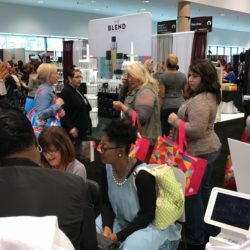 best Trade show specials with you. Up to a year in advance, we are already being approached by the Trade Show organizers to register. If you want the same location as prior years…you best sign on the dotted line immediately. And oh…..this also includes putting down your 50% deposit to reserve. Think about this. The Trade show organizers are sitting on 100’s and 1000’s of dollars for up to 1 year. In addition, we are also approached by the accommodations organizers. 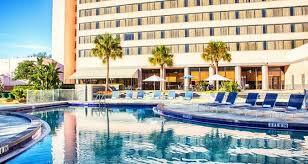 If you have any chance at all in staying in a location near the venue….yup, you need to reserve a reservation. It’s a reservation being held by credit card. No monies is involved at this time. However, you do have to speculate how many rooms you might need because you have to make sure you can accommodate your entire team. Do I have to book any flights? Right around the 3 months mark (before the show), all the thinking you have been doing has to come into fruition. We anticipate, based on past history what we will need for products. Personally, I like to give my Mfg’s an idea of what I will need from them at a particular time. this allows enough time for them to be prepared, so i’m not shorted something on my order. I also solidify who my team will be and what I am choosing to offer at the show. This process happens over about a 2 month period. I also begin talk with my graphics coordinator about new signage, new promotional materials and materials for new items. This also takes place over a period of time, typically towards the end of the 2nd month into the 3rd. I am not a last minute person. Managing these projects over 3 months is just about around the right time to meet deadlines in a comfortable manner. We can’t forget managing of the Education. I always feel it’s a good time to offer Education since there’s a bunch of Beauty professionals in one place at one time. 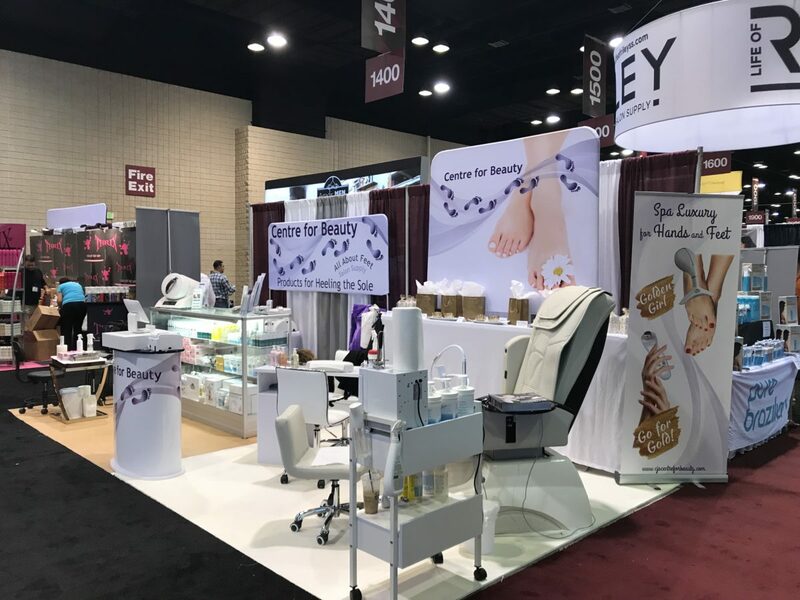 Centre for Beauty typical offers a free class at the show. 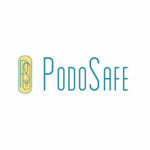 We highlight Urea Foot Care in a classroom setting with a bonus segment of offering a private demo. Many times also, we offer an addendum to the show classes by staying an extra day or coming in a day early for a paid Professional class. In this case, Centre for Beauty is offering a toenail restoration class the day after the show. The class preparation is different as it includes payment. It also includes class materials, a whole different type of powerpoint presentation, a paid classroom location and more importantly, a process in an effort to get the class filled. As the last couple of weeks approach us. It really get’s intense. We are thinking of all the last minute items we need to address. We are following up with shippers, vendors, printers….you name it, to make sure everything prepared is done in a timely fashion…..meaning ON TIME. Flights have been booked, hotels are reserved, products are being received, packing is in process, trucking is reserved and we are beginning to get our show game on. Now the time has come. We manage to make it through all the prep and it’s time for the grueling, physically exhausting, hot (they don’t turn the AC on), mentally exhausting set up time. If it weren’t for YOU though, none of this would exists. YOU give us the opportunity to share our goods, share our education, our experience. YOU give us the motivation to plunge ahead so we can help YOU build your Business. We continue with our education, so we can continue to educate YOU. Through all of it, we are excited. We see people we haven’t seen in a year. We meet new clients, put faces to names and form relationships which makes this Beauty Industry the wonderful community it is. As a Thank You for your support, your encouragement, your continued need for new products, new ideas and new ways to grow your Business, i would like to extend the following special to you. We have expanded our Trade Show space to bring you something which has never been done before (that I know of). A Spa Luxury experience. We offer Demo’s but we have never offered a true Spa Luxury experience. 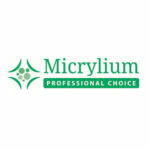 At Premiere Birmingham attendees will witness a complete Anti Age treatment. They will experience the luxury of our Spa Bali product while sitting in a Contego Spa Design chair, finished with our Anti Age treatment under our Golden Girl mask. Since this is our last show of the year 2018, we want to offer you the show deals on the following items. Don’t wait though……Show deals only last through Friday October 26th, 2018. Don’t hate me…you do realize it’s that time of year to order your Holiday Gifts for your clients and for what your clients can buy from you? Gifts, what is it and who thought of it anyway? By definition- A gift given willingly to someone without payment. When it comes to this time of year, I think we all feel a little obligated to give gifts. Personally, I never really liked the gift idea because it does become an obligation. We gift on Birthday’s, Christmas, Showers and more because in Society we have been taught and/or brainwashed that Gifts on any occasion should be given. I feel a Gift is more of a Gift when it’s unexpected. In looking at the definition of Gift, “willingly and without payment” sticks out at me. If you are thinking about giving client gifts, it has to be because you want to, not because you feel you have to. And, you must realize, there is a cost involved for these gifts with no monetary return. However, the ROI received, cannot be calculated. Especially when the gift is thought provoking, usable and memorable. One of the best gifts I gave to my clients when I owned my Salon, is something totally unrelated to our Industry. An ornament! I ordered my ornaments from “Oriental Trading”. They had some really great selections and when bought in bulk, were fairly inexpensive. You can’t just get any ornament. Again, it has to be thought provoking. One year I gave crystal hearts. A great way to tell my clients I love them…..which, I did. What you have to be careful about, are the other Holidays of clients who don’t celebrate Christmas. That’s why the hearts were such a great theme. It was pretty neutral. This gift was a little more costly, but the retail sales which followed afterwards, more than made up for it. I gave a travel size hand cream and foot cream combo. I tried to get flavors conducive to the Holiday and the clients loved it. For those clients who received them earlier in the season, they wanted to buy them as gifts for friends, their own clients and/or stocking stuffers. It was a win win situation. 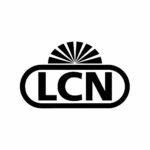 Centre for Beauty has the LCN creams available again this year. Baked Apple Cinnamon, Pinewood, Prestige and Butter Cookie Vanilla, are all available for purchase. The 50ml size is perfect for travel. 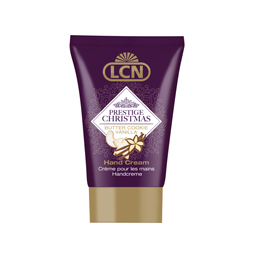 Buy them at an amazing price, and package a single cream in a little gift bag, placed under your tree with your clients name on them. Put your Santa hat on, when you gift it to your client. Before my Salon days, the Salon I frequented to get my nails done offered a Gift Certificate book for 12 months worth of savings. This is a great way to get your clients to try new services, and to cross promote within your own Salon. These are just some recommendations and/or thoughts, you really have to tailor it to your services, your Salon. You have to make sure you cover all your bases. The great thing about this idea, is no cash outlay on the onset, and it’s the gift that keeps on giving. In addition, as I said earlier, it will stimulate clients to try other services. Another idea that always went over well was a cuticle oil and/or conditioner. There are so many available from simple 8ml sizes, to cuticle pens which, are all easy to carry in a purse. Nail Polish is always a great gift as well. A small 8ml size doesn’t set you back a whole lot and if you are thinking about adding nail polish for sale, it’s great way to introduce the brand to your clients. 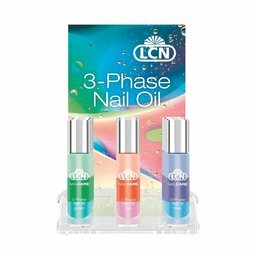 Centre for Beauty offers the 8ml LCN brand of polish. It’s free of everything you can think of, Soy-Gluten-Formadahyde-Paraben free and Cruelty free and it’s a Vegan polish. You can buy the new Holiday sets which gives you 6 polishes (only give your clients one(1)), or you can purchase them separately and choose whatever color you want. Take a look at the color chart and preorder yours today. You want to make sure you begin passing gifts out to your clients by November. Gift giving is personal, and should be rewarding. One year I took clippings of my “Christmas Cactus” and made 35 starter plants. I wrapped them in red foil with a red bow and that was my gift for my clients. They loved them, and many are still thriving and have grown quite big and healthy. Another year, I spent a whole day making chocolate covered pretzel sticks. I wrapped red saran wrap around the ends with a bow, and viola…….thoughtful, personal AND edible. It was so well received, it has become a tradition of which I make extra and bring to my neighbors on Christmas Eve. Wearing my Santa hat of course. Soooooo…who’s idea was it anyway? The giving of gifts may be one of the oldest of human activities that pre-dates civilization and may go back to the origin of our species. Even in primitive cavemen culture, the giving of gifts was fairly common as it was used to show love and affection towards one another. The bestowing of gifts was also inferred as a status symbol when leaders of tribes or clans would show their appreciation for the contributions of those who were part of an important achievement. At Gifts Ready To Go, you will find many gifts ideas to help you find the perfect gift for any occasion and connect with people around you. Whether it was an unusually shaped rock, a tooth from an animal, the bark from a tree or some other item that was natural in origin, the giving of gifts was certainly common behavior long before we became an advanced civilization. As tools were developed, the gifts started to become more elaborate, for example holes were drilled into animal teeth and stones so they could be displayed on necklaces and many other objects were fashioned as well. Later during the Egyptian era, gifts were most notably given to their pharaohs who built massive pyramids to store their wealth for afterlife and produced idols to support their beliefs of idol worship. In Roman times people would present each other with good luck tokens, which lasted for centuries and later influenced all of Western civilization onwards. Such tokens of good luck were used as presents to carry favors and show allegiance, which is still the case today. By the Medieval age, gifts were used to secure the personal favor of the king or show allegiance in times of war. Also, personal gifts of betrothals were given as dowries which ranged from coins to precious metals to a herd of cattle, goats or sheep. In many cultures, dowries and other similar expressions still exist today. Today gift giving is still part of our everyday culture and defines who we are and the message we want to send with our gift. Gifts are given for all occasions and celebrations and are a means of us communicating with each other and expressing ourselves. Today, gift giving is spread across all cultures around the world, from celebrating birthdays, anniversaries, offering good luck, best wishes for getting well, showing love and affection, or just saying thanks. Gifts are given to family members, friends, those we work with and even neighbors who receive gifts of all different types. There are large industries dedicated to creating and selling gifts that allow people even in the busiest of times to find the right type of present to give someone for many different reasons and occasions. The psychology of why gift giving is so rewarding is simple it allows people to connect. The giver of a gift expresses their feelings and emotions by sending a gift with the hope of being able to share these with the receiver of the gift. The receiver of the gift in turn receives the feelings and emotions and with this a connection is made. Making connections with people around us gives us a sense of purpose and feeling of satisfaction. This feeling is one that enlightens the soul and brings out the best in us. There is an old saying “it is better to give than receive” and it has a special meaning especially when the realization of the benefits that it provides to those who give. We Feel Happy: Simply put, the giving of gifts can make a person feel happier about themselves as well as to the person that has received their gift. In studies were people were asked to give gifts as a part of an experiment, the result was that people actually felt better and happier about their own lives. Improve State of Mind: Research suggests that giving gifts may improve a person’s state of mind. If giving a gift makes you feel happier with a sense of purpose then this may inevitably improve your state of mind. Greater Social Connection: By giving a gift, you not only expressing your feelings but building a stronger connection to that person as well. Not only does the person receiving the gift feel closer to the giver, but vice versa as well. This greater social connection also means an improvement in the state of being as well as overall happiness. It’s Contagious: When a person starts giving gifts, not only will the recipient become more likely to give, those around them who see this act will start giving as well. This is in part due to the release of the endorphins, which not only benefits the giver, but is also felt by those who receive and see the act of giving as well. 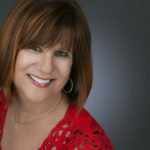 Visit giftsreadytogoblog.com for more interesting articles on the history of aromatherapy, cast iron teapots, silk flower arrangements and more. My oh my oh my. It has been several months now, I have removed myself from the constant grind of Social Media. Don’t get me wrong, I still participate for the purpose of Business Building. I answer questions i’m tagged in. I respond to messages. What I don’t do however, is participate in to many threads. I’ve learned Social Medial can be downright belittling, nasty, shocking, mean and very very sad. It can be disappointing, it can be stressful and it can be haven for bullying. AN Influencer is a user on social media who has established credibility in a specific industry. A social media influencer has access to a large audience and can persuade others by virtue of their authenticity and reach. The connection to Influence vs Influencer and this article is to first address what can happen on Social Media. A thread I caught recently began as an innocent question on Social Media which turned into something ugly, yet beautiful. The 1st amendment allows our voice to be heard. What it doesn’t do is help us understand that words hurt! In some ways I guess to influence and to be an influencer are much of the same thing. Someone or something brings awareness to someone or something and helps us decide what to do. In both cases, be it the person who influences or the influencer, it is usual someone who has worked countless hours of discovering his or her image. Someone who has spent countless hours of building his or her “brand”. This “brand” recognition does not come easy. It is non-stop studying, perfecting and maintaining a high level of standards expected by those of us who follow. It can be fun, there may be some perks, but it also can be tedious. Many of you may not know that my Business is within a Business. I rent warehouse and office space from some very special people who I consider B2B partners, and friends. 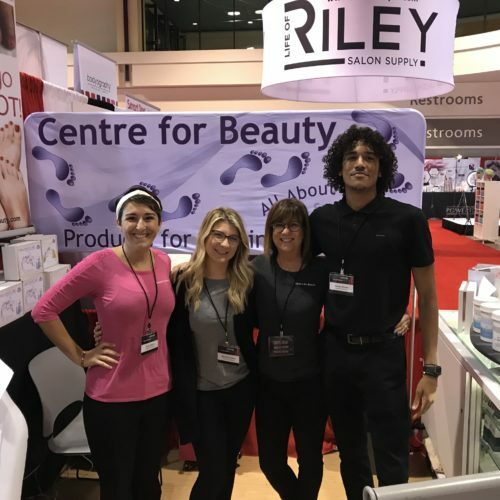 Life of Riley Salon Supply, promoting primarily hair products. I’ve been blessed with the relationships i’ve formed and i’ve been lucky enough to have learned a lot about the differences in our Industries. Yes, hair and nails are within the same industry, yet……they are not at all treated the same. I could get into the various amount of differences, but for the purpose of this article, I think it’s worth sharing the very minimum amount of cruelty I see and/or hear regarding social media. In hair we see before and after of many creations. Whether it be color, cut, extensions etc. I see tons of compliments and support. What I don’t see is the ridicule, the callous remarks, the belittling, the nastiness, the lack of support. However, when it comes to our nail industry, it’s the complete opposite. I am constantly seeing the negativity, the jealousy, the lack of Professionalism. I’ve worked for many years,, in fact I have made it my mission to take us Nail Technicians from the bottom of the totem pole and put us on the top. This is a big nut to crack and it can’t be done alone. All of us have to contribute. We have to look like Professionals, talk like Professionals, act like Professionals. We have to support each other. 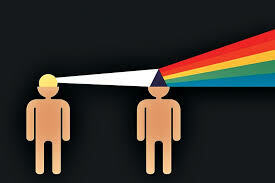 We have to learn how to express our opinions, our thoughts without hurtful expressions or comments. We have to support the differences between us and raise the bar on the image of our Nail Society. Every single one of us either influence or is an influencer. We are being watched, we are being heard. We all need to set the example. It may sound like i’m rambling. I’m not. I’m saddened by what I recently saw, but i’m also elated to have seen the tremendous amount of support which followed. I am also hopeful that in some way i’m able to influence those of you who read my blogs in a positive manner. I hope I help you think about the various amount of options which are available in our Industry. I hope I am able to teach you something you maybe didn’t know prior to reading my blog. I hope I have a positive influence on your growth. Have you thought lately about who you can or who you already do influence?